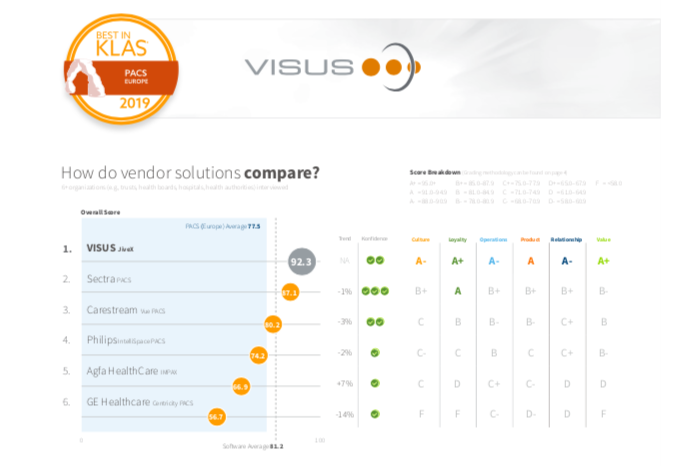 VISUS JiveX wins Best in Klas Awards 2019! As Graina is represents the company VISUS in Lithuania, we are extremely proud! The concurrents were very strong - Sectra (PACS), CARESTREAM (Vue Pacs), Philips (IntelliSpace PACS), Agfa HealthCare (IMPAX), GE Healthcare (Centricity PACS). The Global Best in KLAS report examines the performance of multinational healthcare information technology (HIT) products and vendors in regions outside the United States, including Asia/Oceania, Canada, Europe, Latin America, and the Middle East/Africa. Country-specific and custom solutions are not included in the data. In previous years, this report has awarded Best in KLAS status to products based on their aggregate performance across all regions and has recognized regional performance leaders with a separate award, the Category Leader. In contrast, this year’s report does away with Category Leaders and instead awards Best in KLAS status to one EMR and one PACS solution in each separate region. This expansion to the number of Best in KLAS awards reflects the continued growth of HIT adoption around the world as well as KLAS’ expanded global research efforts and allows feedback to focus more on how well vendors meet unique, local needs.